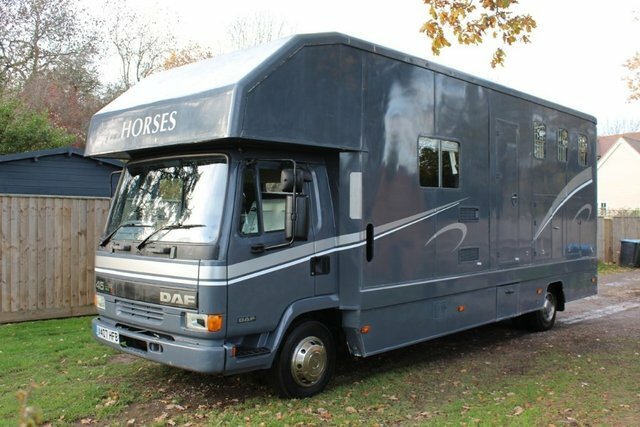 This 2001 Leyland DAF 7.5T Horse Box Van has been carefully looked after & is in great condition! Able to fit two horses & a pony with 3 separate compartments at the rear of the truck. Facilities include CCTV, Hob, Sink, Toilet & Shower! It has just been plated and supplied with a comprehensive S/H! Originally a BT from new box lorry where it covered most of it's mileage and then converted to a full 'living in' horse box to order by the prevoius owner. Just having had 3 owners in total from new, this lorry has covered less than 1500 miles in the past 4 years! Properly maintained throughout its life with lots of money spent on the maintainence in the last few years and still a pleasure to drive. Blown air heating to keep you warm day and night with hot shower facilities at the end of the day, flat screen dvd/tv, fridge, gas hob, internal water tank, microwave, leisure batteries and all ready to hook up to a mains source electric or run off your own compact generator to give you that independance. Lovely condition for the age with the drivers cab area recently re-trimmed. Really will give some great enjoyment to the new owner!, YOUR PART EXCHANGE IS WELCOME SO PLEASE CALL US 01442843884 OR VISIT OUR WEBSITE FOR 20+ PICTURES! Get the best deal on a used van for sale in Little Gaddesden by making your way to Ashridge Vehicles Ltd today. You will find every available model listed here on the website, and as all our stock is competitively priced you should have no problem sourcing a pre-owned to suit your budget. Take the opportunity to browse our current range online before contacting a member of the showroom team to find out more. Our friendly and knowledgeable staff will be more than happy to answer any questions and provide advice and guidance when necessary. Alternatively, why not pay a visit to our showroom in person and take a closer look at the selection of used models for sale.